Chances are, the only time you’ve heard of an organ in your body called the pancreas, it had to do with cancer. Celebrities like Patrick Swayze and Steve Jobs both died highly publicized deaths of pancreatic cancer. 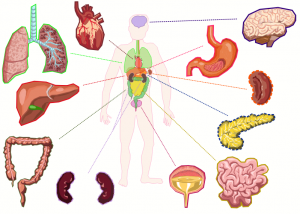 But what is the pancreas, and what does it do in the body? Let’s take a look. The pancreas is an organ in the upper abdomen mostly hidden behind the stomach. It looks like a fish stretched horizontally across the abdomen, with the head nestled into the first part of the small intestine. A healthy pancreas has two main functions: to help your body digest food and to help your body regulate sugar levels. The pancreas produces digestive enzymes that, along with your stomach acid and bile, help your body break down carbohydrates, proteins, and fats in the food you eat. When the digestive enzymes are produced, they travel down ducts in the pancreas until the enzymes are expelled into the small intestine, mixing with food that has just exited the stomach. The pancreas also plays a role in regulating blood sugar. Small clusters of cells which produce hormones called insulin and glucagon are scattered throughout the pancreas. Insulin lowers blood sugar levels when they get too high. Glucagon elevates blood sugar levels if they get too low. Maintaining a steady blood sugar level is important to the functioning of other organs in your body, like your liver and brain. For people who have diabetes, the cells that produce insulin are not working properly. If they are still producing some insulin, a patient may take oral medications to help them produce enough to keep the blood sugar stable. However, if the cells are not producing any insulin, a patient will have to inject insulin to regulate their blood sugar. This is called insulin-dependent diabetes. Being overweight or obese makes the body less sensitive to insulin produced by the pancreas. This means that in order to maintain acceptable blood sugar levels, the pancreas must work harder. Eventually, the cells in the pancreas which produce insulin can burn out after long periods of overwork. This manifests as diabetes. Losing even 5-10% of your body weight to a healthier weight can boost your pancreatic health. Drinking large amounts of alcohol causes inflammation in the pancreas. After a long period of drinking too much (weeks and months), the pancreas can become chronically inflamed. This is called chronic pancreatitis and manifests as abdominal pain and digestive problems. The pancreas can also become acutely inflamed from too much alcohol. This is called acute pancreatitis. This is an exceptionally painful condition, usually accompanied by nausea and vomiting, that often requires hospitalization. It can become so severe that it causes death. When you exercise, your body uses sugar in your blood for energy during your work out. This is less insulin your pancreas has to produce itself, and it gives the pancreas a break. Eat a healthy diet with plenty of fruits, vegetables, and lean sources of protein while minimizing fried, processed, and high sugar foods. This can help with weight loss and can help reduce triglycerides. Very high levels of triglycerides in the body can trigger acute pancreatitis. Pancreatic cancer is notoriously difficult to detect in early stages because there are often no symptoms present. If there is a family history of pancreatic cancer, you may need to be screened. Talk to your healthcare provider about this.